The report covers the analysis and forecast of the Automotive Polycarbonate Glazing market on global as well as regional level. The study provides historic data of 2016 along with the forecast for the period between 2016 and 2025 based on revenue (US$ Mn). 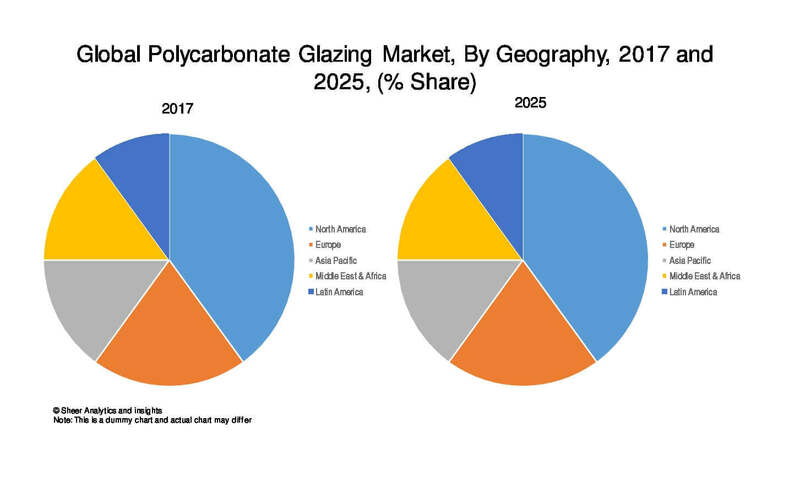 The study provides a detailed view of the automotive polycarbonate glazing market, with segmentation based on by application, by glass, by plastic compound, by vehicle and regional demand. In automotive industry, the advantages of polycarbonate material have boosted the adoption of automotive polycarbonate glazing market. The use of polycarbonate reduces vehicle weight which in turn improves the vehicles fuel efficiency. Furthermore, the rise in demand for light weight materials and the market growth for automotive sunroofs have flourished the growth for global automotive polycarbonate glazing market. Apart from just light weighting polycarbonate glazing has improved functionality and increased design freedom that have gained a huge importance among automotive OEM (Original Equipment Manufacturer) while choosing materials. Thus in the future it is expected that the automotive polycarbonate glazing market will achieve significant growth opportunities during the forecast period of 2016-2025. Regional segmentation includes the current and forecast demand for North America, Europe, Asia Pacific, Middle East & Africa, and Latin America. The segmentation also includes demand of the technology and applications in all regions. The competitive profiling of the key players in the global automotive polycarbonate glazing market across five broad geographic regions is included in the study. These include different business strategies adopted by the leading players and their recent developments, as in the field of automotive verticals. A comprehensive analysis of the market dynamics that is inclusive of market drivers, restraints, and opportunities is part of the report. Additionally, the report includes potential opportunities in the automotive polycarbonate glazing market at the global and regional levels. Market dynamics are the factors which impact the market growth, so their analysis helps understand the ongoing trends of the global market. Therefore, the report provides the forecast of the global market for the period from 2016 to 2025, along with offering an inclusive study of the automotive polycarbonate glazing market. The report provides the size of the automotive polycarbonate glazing market in 2016 and the forecast for the next nine years up to 2025. The size of the global automotive polycarbonate glazing market is provided in terms of revenue. Market revenue is defined in US$ Mn. The market dynamics prevalent in North America, Europe, Middle East and Africa, and Asia Pacific have been taken into account in estimating the growth of the global market. Market estimates for this study have been based on revenue being derived through regional pricing trends. Demand for automotive polycarbonate glazing has been derived by analyzing the global and regional demand for advanced telematics in each application for its respective functions. The Automotive polycarbonate glazing market has been analyzed based on expected demand. Forecasts have been based on expected demand from automotive polycarbonate glazing applications. We have used the bottom-up approach to estimate the global revenue of the automotive polycarbonate glazing market, split into regions. Based on, application, by glass, by plastic compound, and vehicle type, we have summed up the individual revenues from all the regions to achieve the global revenue for automotive polycarbonate glazing. The application split of the market has been derived using a bottom-up approach for each regional market separately, with the global application segment split being an integration of regional estimates. Companies were considered for the market share analysis, based on their innovation and application and revenue generation. In the absence of specific data related to the sales of automotive polycarbonate glazing several privately held companies, calculated assumptions have been made in view of the company’s penetration and regional presence across all applications. Automotive polycarbonate glazing shows a high growth potential along with the rise in demand of vehicles across the world. Polycarbonates are plastics which have polymers containing chemical carbonate groups. In the automotive sector, Polycarbonate materials are generally used in window or glazing installation. Polycarbonate materials are transparent glass having high thermal resistance. The use of polycarbonate reduces vehicle weight which in turn improves the vehicles fuel efficiency. Moreover, in recent days the increase in pollution level as creates the demand for reduced fuel consumption and energy efficiency acting as the driving factor for adoption of polycarbonate glazing in the automotive sector. Furthermore, the rise in demand for light weight materials and the market growth for automotive sunroofs have flourished the growth for global automotive polycarbonate glazing market. Thus polycarbonate glazing helps in creating a massive potential market for various applications and most of the automotive companies to adapt the technology in the coming years. According to the market structure, globally the automotive polycarbonate glazing market is valued at US$ 1.49 Billion in 2016, having a strong growth rate at 16.5% CAGR that is projected till 2025. Automotive polycarbonate glazing market has been on a growing stage throughout the forecast period. This technology offers wide range of benefits to automobile companies as well as the vehicle owners due to its light weight that improves the fuel efficiency of vehicles. Polycarbonates (PC) and Polyvinyl Butyral (PVB) are the two major plastic compounds that are being used in glazing or window application. Apart from just light weighting polycarbonate glazing has improved functionality and increased design freedom that have gained a huge importance among automotive OEM (Original Equipment Manufacturer) while choosing materials. The reduced vehicle weight as well as reduction in carbon dioxide emissions by application of polycarbonate is expected to create a huge growth opportunities during the forecast period of 2016-2025. Major applications of automotive polycarbonate glazing covered in report are panoramic roof, Rear windows, front windshield, and side windows. The report has been segmented by glass type into two different categories such as laminated glass and tempered glass. Further down the report is segmented by plastic compound that is categorized into two parts such as polycarbonates (PC) and polyvinyl butyral (PVB) and lastly by vehicle type that are passenger car and light commercial vehicles. Polycarbonate glazing technology will be one of the major trends to gain traction in this market in the upcoming years. In automobile industry the polycarbonate glazing is a new kind of technology to achieve vehicle weight reduction which results in better vehicles fuel efficiency. Further down, the polycarbonate compounds offers higher grade mechanical properties and along with improved design freedom. The most commonly used glazing materials are the laminated glass and the tempered glass which holds a major share in the glazing applications. However, apart from this, there are also some downsides with this automotive polycarbonate glazing market. Firstly, they are not scratch resistant. Secondly, the polycarbonates needs to be coated with a coating material to make it scratch proof which in turn rises the cost of automotive polycarbonate glazing thus hampering their promotion in the automotive sector. Some of the major players in the automotive polycarbonate glazing market are Covestro AG, Webasto SE, Freeglass GmbH & Co.KG, Saudi Basic Industries Corp., Mitsubishi Engineering – Plastics Corporation, CHI MEI Corporation, Trinseo S.A., Teijin Limited, and Krd Sicherheitstechnik GmbH among others. 11.4 FREEGLASS GmbH & CO.KG. 11.5 SAUDI BASIC INDUSTRIES CORP.